With engaging LIFEPAC 1st Grade Math, student's will begin to learn basic math concepts like addition, subtraction, and number sequence. Other topics include: Fractions, Time and Symbols, Money and Measurement, and Number Words to 99. Self-paced and entertaining, worktexts also include fun skill activities such as drawing colors and shapes, dot-to-dots, and matching similar objects. Eye-catching illustrations keep student's involved in their lessons, aiding mastery learning. 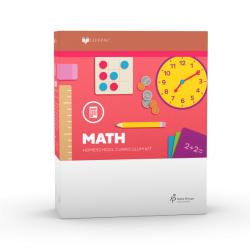 The LIFEPAC 1st Grade Math Set contains ten worktexts and two teacher's guides (these may also be purchased individually).